SMS messages make it convenient for communication between cell phone users. When more and more text messages are filling up your phone memory, deleting text messages from your Samsung phone's inbox become necessary. But you just carelessly delete an important messages and want to get it back. However, if your Samsung mobile phone is broken or dead due to any reasons, is it still possible to get the deleted text messages back? 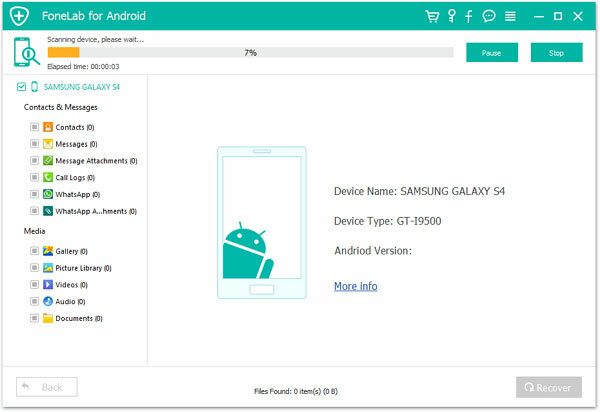 Now, a recovery program is able to help you retrieve recently deleted text messages from a dead or broken Samsung mobile phone, called Broken Android Data Extraction. It is a powerful Samsung SMS recovery program to restore any and all deleted text messages, as well as contacts, photos, videos, music, call history and documents from broken Samsung phone. 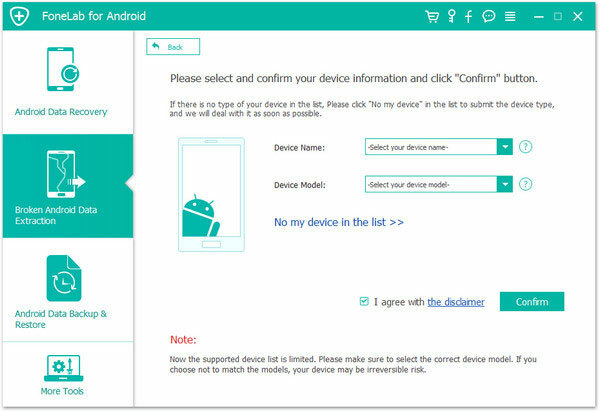 Currently, this program only supports Samsung device in Broken Android Data Extraction mode, Other more Android phones will be supported soon, such as HTC, Motorola, Sony, LG, Huawei, ZTE, Google Nexus and so on. Supported Devices: Samsung Galaxy S6/S5/S4, Samsung Galaxy Note 5/Note 4/Note 3, Samsung Galaxy Tab Pro 10.1 and more device models. 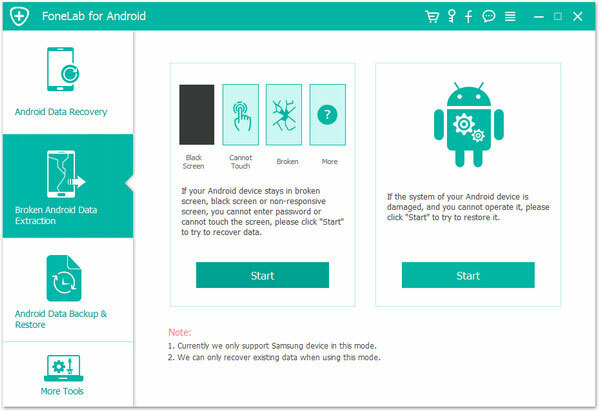 Free download the broken Samsung SMS recovery program - Broken Android Data Recovery on your computer and use that program to rescue deleted files from your Android phone. How to Rescue SMS Messages from Broken Samsung Galaxy? Step 1. 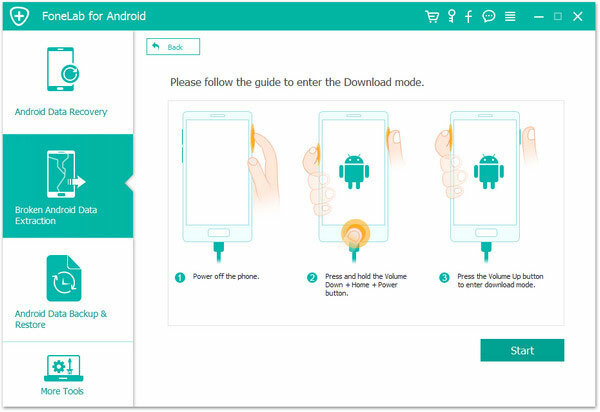 Use a USB cable to connect your Broken Samsung phone to computer, launch the downloaded and installed Broken Android Data Recovery and the program will detect the connected Samsung phone instantly. Choose "Broken Android Phone Data Extraction" from the left of the program screen. Step 2. Click the "Start" button and then choose the name and model of your Samsung phone. Then, click "Confirm" to see whether your phone is supported to be fixed by the program. Step 3. Next, you should put your Samsung phone into Download Mode. Just follow the guide in the interface to enter the download mode and then click "Start" button to fix your phone. Step 4. After the operations above, the program will scan your phone data automatically and show the recoverable file types on the left sidebar. Choose "Messages" you need and click "Recover" to recover all text messages on your computer.